This post was also given as a sermon at the historic Madison Avenue Baptist Church in NYC as well as featured by Psychology Today. To me, life is like going to the grocery store. 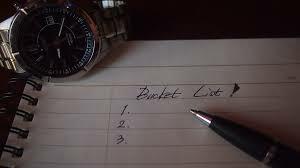 If you don’t have a list before you go, you end up leaving without the stuff you want and with a load of stuff you don’t want. We all have our hopes and dreams. Maybe it’s a trip you want to take, a book you want to write, a song you want to sing, a skill you want to learn, or a relationship you want to heal. The problem is that we’re always thinking, I’ll get to it later; I’ve got time. Newsflash: Never take time for granted. Never. The book of Proverbs says, “Do not boast about tomorrow, for you do not know what a day may bring.” And if you need further proof, just look at our daily headlines. Life can change in the blink of an eye. The sad thing is that we waste so much of life’s fleeting moments by doing things like complaining. We complain about our parents and then miss the precious years we have left with them. We complain about our kids, and in the blink of an eye, they’re grown and gone. We complain about getting old and taint the years we still have to enjoy life. We can complain our way through an entire life. And then it’s gone—never to return. A friend of mine adopted a dog from the local shelter. It was a very cute Collie/Labrador Retriever mix that was within days of being euthanized. After the paperwork was done, she took him home and immediately named him “Just-in” for just in time. Just-in’s story is our story, too. Maybe you feel stuck in a dead-end job. Maybe you’ve let your relationship fizzle out. Or maybe you feel your dreams have faded or your sense of joy has disappeared. Many of us are walking this earth physically alive but dead of spirit, operating at the level of our social security number—existing but not living. But time is ticking . . .
Whatever is important to you, whatever you feel passionate about doing in this life, don’t take time for granted. Don’t waste the gift you’ve been given. Figure out what’s top on your list . . . and do it now.